I ran across this on the Home Model Engine Machinist forum. I think it is an ingenious, easy and almost fool-proof way to make a spoked flywheel with just a lathe and drill press. 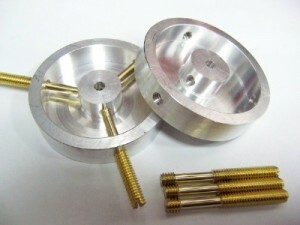 The flywheel blank is turned as shown and the spokes screwed in. The back is then cut away and the rim turned down a little bit so the spokes are flush. You can see more pictures and the finished flywheel by visiting the link. Wow what a great idea!!! Great site too by the way!